Providing plenty of football themed fun without the need to pull on your boots, Football Rules is a five reel and 25 payline slot game which boasts wild symbols, scatters and a large overall paytable. Certain to appeal to any fan of the beautiful game, all of the game’s symbols and images are footy themed, and its fun bonus game is based on the drama of a penalty shootout. The game’s large paytable, in concert with added wilds, scatters and a bonus game, make the potential for winnings impressively high. Players can alter the number of active paylines as well as their chosen bet per line, to give them outstanding control over their total stake amount. The fun footy theme and matching innovative penalty shootout bonus game is sure to appeal to the millions of football fans who also like to have a bet..
A maximum payline jackpot of 10,000 coins means that a cool £50,000 can be won from one spin if the highest bet level is chosen. 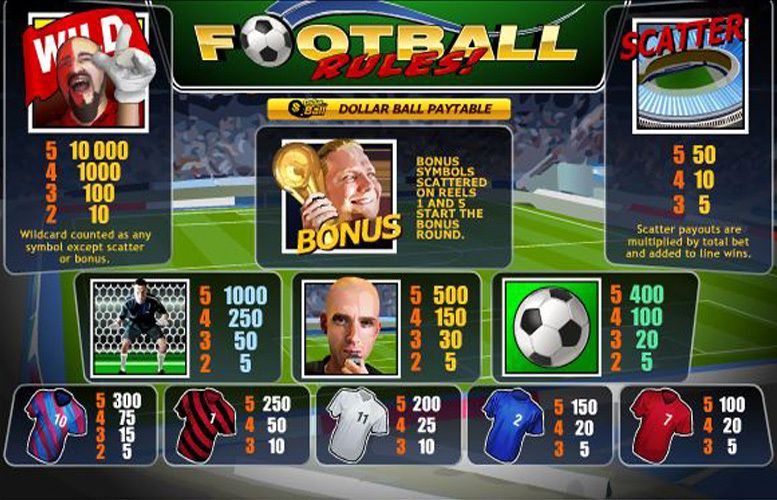 Unlike other similar slots, Football Rules only has one bonus game so gameplay is pretty repetitive and unchanging. The slot is not linked to a progressive jackpot, but its impressive payline jackpots do help to make up for this. Designed as a slot game representation of a football match, Football Rules features a total of five reels populated by all footy related symbols. In common with almost all slots, payline jackpots are won by revealing between two and five matching symbols consecutively along any active payline, with five symbol combinations being the best. The most valuable combination overall is one made up of five of the game’s football fan wild symbols, which on an active payline delivers a total jackpot of 10,000 coins. At the highest coin value of £5, therefore, that jackpot will be worth an impressive £50,000. 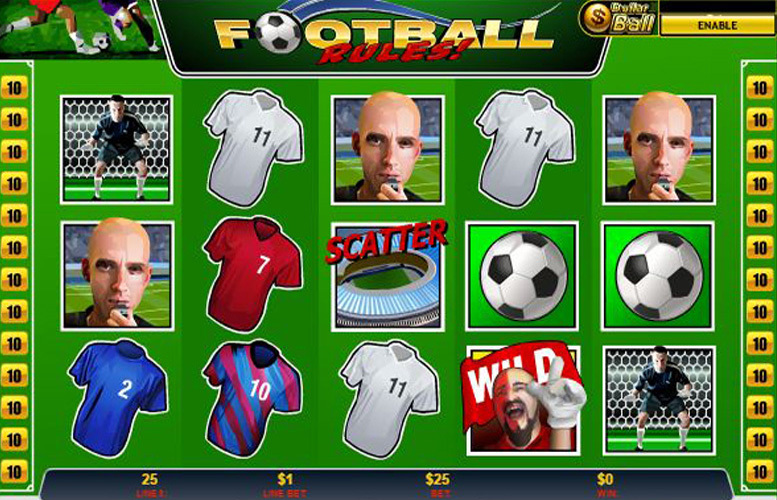 Additional chances to win, too, are offered by the Football Rules slot thanks to its scatter symbols and free spins with valuable multipliers attached. The bonus symbols for Football Rules depict sparkling trophies and can appear on either reel one or reel five. If they appear on both at the same time, the slot’s bonus game is then triggered and is themed around a penalty shootout. Within that game a player has to select one of a number of potential footballs to take their penalty and that choice determines how many free spins they get and which multiplier will be applied to those free spins. Free spins range from two to 20, the Multiplier can be as high as 10 times and the total number of free spins that can be won overall in the game is unlimited. As well as the trophy bonus symbols, Football Rules also features a scatter symbol showing a football stadium. The scatter symbols can appear anywhere on the reels, and if three or more appear anywhere, they can deliver winnings of up to 50 times the player’s wager. As we discussed above, the football fan wild is the most valuable symbol in Football Rules but it also plays another role. That is that it can substitute for any other symbol within the game to produce the most valuable possible symbol combination along an active payline. Alongside the bonus, scatter and wild symbols in the Football Rules slot, there are also a collection of other footy themed regular symbols. Those include football shirt symbols, referee symbols and goalkeeper symbols, with the latter being the most valuable of those. If five of those goalkeeper symbols line up along an active payline, in fact, it can deliver a payline jackpot worth 1,000 coins. That means that at the highest possible coin value, the jackpot will be worth a very generous £5,000. In order to keep control over their staking, Football Rules players are given a number of options when it comes to setting their betting amounts. Those options include the ability to choose how many paylines are active within the game, from one to a maximum of 25, and the ability to set their coin value. The lowest possible coin value is just 1p, the highest is £5 and there are a variety of further options between the two. Certain to appeal to any footy fan who also likes a quick and simple slot, Football Rules is sure to deliver hours of fun as well as providing great opportunities for sizable winnings. The slot’s scatters and wilds add extra chances to win to what is an already large paytable, which is headlined by a generous maximum payline jackpot of a potentially life changing £50,000. Bonus symbols, too, trigger a fun bonus game that improves gameplay further and can lead to even more beneficial free spins. Aside from the bonus game, however, added features are somewhat limited and that could mean that fans of more complicated or involved slots may wish to choose a different option. This game has a rating of 3 / 5 with 298 total reviews by the users.